The wind machine continued to blow on Day 3 of the 2017 - sponsored by René Egli - to provide another afternoon of explosive freestyle - although for a time the wind was almost too strong, even leaving the guys completely stacked on 4.0s. By the end of Day 3 a further two rounds of the men’s double elimination have been completed, while Sarah-Quita Offringa (Starboard / NeilPryde / Maui Ultra Fins) remains on course to capture a 10th consecutive PWA Freestyle World Champion after successfully defending her single elimination crown against Maaike Huvermann (Starboard / Severne / Maui Ultra Fins). Maaike Huvermann found her stride today as the current vice-world champion, firstly ended the hopes of Arrianne Aukes (Fanatic / NorthSails / Maui Ultra Fins), before exacting revenge against Oda Johanne (Starboard / Severne / Maui Ultra Fins) with quite possibly her best heat so far on the PWA World Tour as she landed a mix of sliding moves and power moves to earn the right to face 9-time PWA Freestyle World Champion - Sarah-Quita Offringa in the winners’ final. Huvermann produced another fine display in the final as she applied some genuine pressure against Offringa by rotating through a regular kono and a sick shuvit spock, while attempting a culo as she tried to bring all of her tricks to the table, but crucially the 19-year-old was missing a move on port tack, which is quite simply a mistake you can’t afford to make against the freestyle Queen. Offringa, may have been more nervous than usual after seeing Huvermann’s performance in the semifinal, and spending the entire day waiting, but the 26-year-old sailed with her usual swagger and style to keep her unbelievable unbeaten record in tact with a combination of shakas, burners, konos and a text-book toad as the Aruban gem takes another step towards world title No.10. Antony Ruenes (Tabou / GA Sails) had to wait until almost the end of the day to sail his sole heat of the day, but when his time arrived the Frenchman produced a performance well worth waiting for as he posted the highest scoring heat of the day - 154.7 points - to end the hopes of Marco Lufen (Fanatic / NorthSails) who had sailed well earlier in the day to defeat Eliran Levi (Tabou / GA Sails / Maui Ultra Fins) and Jeremy Plüss (Tabou / GA Sails). However, the German was powerless to prevent Ruenes marching on his landed a pasko, shifty, air skopu and a trademark no-handed burner and he will now face Antoine Albert (Goya Windsurfing) in the next round after the New Caledonian sent Francesco Cappuzzo (RRD / RRD Sails / AL360) packing. Rick Jendrusch (Severne) enjoyed a fine day on the water as he staged a late comeback against Jamie Howard (JP) to setup a duel against Nicolas Akgazciyan (99NoveNove / Challenger Sails / Maui Ultra Fins), which needed a resail to decide the winner. In the first effort it was almost too windy with both sailors wildly out of control but in the resail the wind dropped and an enthralling battle followed with both pulling out all the stops. However, it as the young Dutchman who gained the upper hand with a powerful and fluid display to cause an upset. Jendrusch looked absolutely delighted upon hearing the result, while Akgazciyan cut a deflated figure. The 22-year-old will now face Sam Esteve (JP / NeilPryde) after the Frenchman cut Davy Scheffers (Tabou / GA Sails) comeback short. Youp Schmit (99NoveNove / Avanti) dispatched of Johnny Yagen (RRD / RRD Sails) in his opening heat of the day with a powerful display, but then saw his comeback in the double halted by Balz Müller (Patrik / Severne), who learned from his mistakes on the opening day to sail a solid heat while still bringing his own unique, radical approach to the table as he landed a sick tweaked pushloop and a shifty to set up a tie against Taty Frans (Starboard / GA Sails / Mystic). Frans began his comeback today, after a shock second round exit in the single and he eased his way past Loick Spicher (RRD / RRD Sails) in his first heat, before edging past Italy’s Mattia Fabrizi (Patrik / Sailloft Hamburg) in Heat 38b - who failed to complete his score sheet on port tack and missed out by just over 10 points. Heat 40b saw an extremely tight tussle between Tonky Frans (RRD / RRD Sails) and Giovanni Passani (Tabou / GA Sails), but in the end, it was Frans who sneaked through with the Italian missing a move on starboard tack. In the opening stages of the heat, Frans landed the biggest jump of the contest so far as he executed a massive stalled forward. The Boanirean will now face Philip Soltysiak (Starboard / Sailworks), who sailed well in the howling winds to see off the challenge of Adrian Beholz (Patrik / Sailloft Hamburg / Maui Ultra Fins). The forecast looks promising again for tomorrow and the sailors will meet again at 10:30am for the skippers’ meeting - with the action commencing from 11am (GMT+1) onwards. Make sure you tune into www.pwaworldtour.com to watch all of the explosive action as it happens via the PWA live stream. 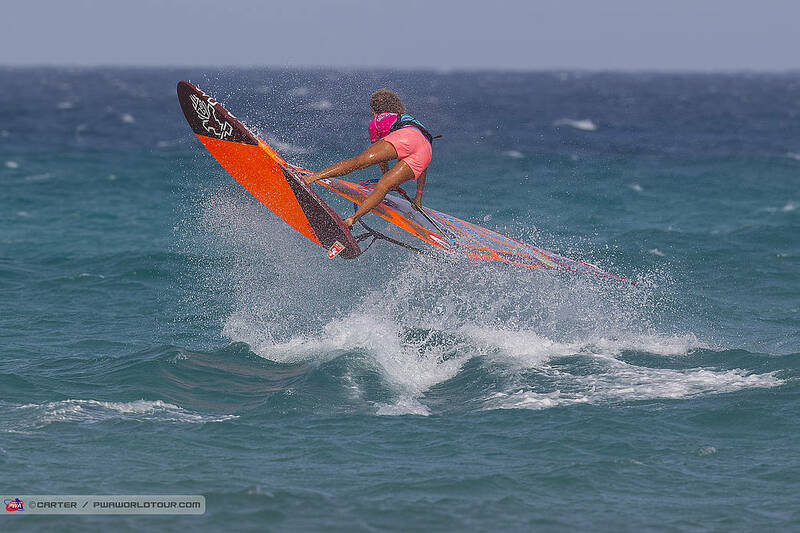 To stay up to date with all the latest developments from Fuerteventura — including the live stream, elimination ladders, entry list, images and live ticker simply click HERE and scroll to the bottom of the page.